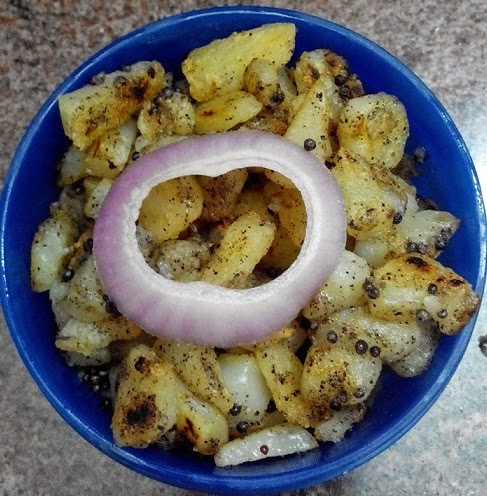 A quick and a simple Side Dish.. Perfect for Lunch Boxes!!! Cook the Potatoes and peel off the skin, Smash and keep it aside. Heat a Wok, and add the Oil. After the oil is heated, add the "To temper" items. After the Sizzling sound subsides, add the Smashed Potatoes. Add the Turmeric Powder, Pepper Powder and Salt. Keep it in Low flame and Fry for 12-15 Minutes till the whole gets fried. Super deliciopus Pepper Aloo Stir Fry is Ready!! !